Mainstream Media Admits In Storytelling Fashion: ISIS Commander Is U.S. Trained! Anyone getting their facts, news and information outside the spectrum of the tiny information bottleneck known as mainstream media is probably tired of hearing it by now. The Islamic State or ISIS is a terror organization created, funded and armed by the U.S. and its allies particularly Israel, Turkey and Saudi Arabia. These U.S. created new world order thugs trained primarily in Jordan and many of them are the exact same "rebels" who have been admittedly armed and trained by the U.S.. Many of these terrorist "rebels" turned ISIS fighters are known to be visited and befriended by global terrorists like John McCain and others. These facts are all well established in recorded documents and independent media reports all over the world. The ridiculous, treasonous and intelligence-insulting never-ending story behind ISIS has been rehashed and exposed too many times. To understand who ISIS is, and to understand the PNAC plans (Project for a new American Century) is to understand almost the entire scenario unfolding in Syria and the entire Middle East as humanity is slowly lead down the path of world war 3. It also allows you to understand how the globalist are setting up America for a future false flag attack to take away even more of your liberties, all to be blamed naturally on ISIS. Make no mistake however, whether we like it or not, the ISIS show rolls on. It rolls on because there are still many brainwashed Americans who still actually believe the ISIS show and for those people, writer "Mitchell Prothero" a "special correspondent" for "The McClatchy Company" has submitted an article which mainstream media was more than happy to circulate. 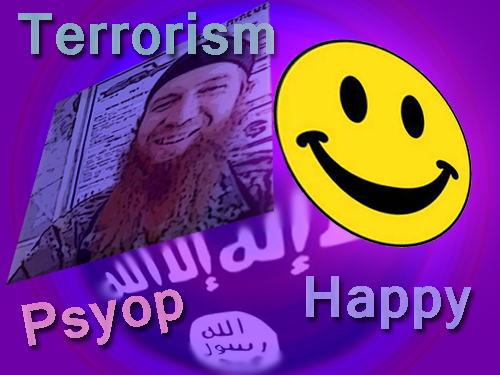 The article tells a fantastic, very detailed and almost romantic story about a nice smiley face (Israeli looking) man named 'Abu Omar al Shishani', formerly known as 'Tarkhan Batirashvili'. In this story you are led to believe this nice man was trained by the U.S. to fight as a Syrian rebel. Incidentally, posting a smiley face image, I believe is done deliberately. This is propaganda to make the story more believable. For comparison, here in the U.S. when someone is wanted or if there is a "manhunt" for someone, the picture of the person being sought after is always a scary, angry looking picture NEVER a smiley face picture. They do this for psychological reasons. In this recent ISIS commander story writer Mitchell Prothero details many things about Abu Omar's life as if he knows the guy, has followed his journey and has interviewed him personally. The story has a warm feel as readers are lead to almost root for Abu Omar. As the story goes on, it implies that Omar coincidentally transferred his skills over to ISIS then moved up the ranks as an ISIS commander. This latest mainstream media ISIS glorification psyop is just another slap in the face to Americans by CIA and their lying mainstream media. This is much more of a psyop in my opinion than predictive programming and lesser magic of showing you what they are going to do before they do it. The globalist are now perfecting the art of actually admitting to its readers the truth, while at the same time making them believe the complete opposite. They are not even hiding that the U.S. actually trained this now top ISIS military commander. The psyop is very different here as the writer attempts to pull in the audience into a long human interest story filled with so much detail that you forget that ISIS is supposed to be a totally independent terror network that rose out of nowhere as pure enemies of the U.S. and (of course) Israel. In comparison with the Al Qaeda psyop of the 1990's leading up to the 9/11 false flag, can you imagine a mainstream media article on MSN or CNN say in 1998-1999 admitting that the U.S. trained Al Qaeda? Even though it became common knowledge to truth seekers after 9/11 most people were not informed about this back then and the mainstream media would certainly not have admitted this then. This goes to show us how sophisticated and profound the government propaganda is today. Fast forward to September 2015- the future of humanity hangs in the balance, the globalist western cabal's PNAC plans roll on and world war 3 has unofficially begun in Syria. CIA's/Mossad's ISIS continue their ISIS show on humanity. In one year ISIS remains unscathed, forever invisible and undefeatable to every military unit in the world. They remain ever-growing, will never attack Israel and are always everywhere and in your face, all at once as they enjoy their endless influx of untraceable supplies, weapons, food, water, public relations, fame, glamour, and even their own gold-backed currency! So deep and so ongoing is the ISIS psyop that most people in alternative media (understandably so) ceased covering the daily ISIS show long ago. Some of us are still occasionally covering unique developments but by and large ISIS is faded away. And how can anyone disagree with that? All things come to an end, but when governmental systems pay to keep a show going eventually the normal functioning human minds simply ignores the show. Like a music band or a TV show that has passed it's prime or "jumped the shark" the ISIS show in the minds of many people ended long ago. Ironically, I believe that BECAUSE the day-to-day ISIS show ended long ago, that is precisely the reason the control system was able to sneak an absolute psyop story on alternative media about a week ago. Remember this story talking about how "50 spies say ISIS intelligence was cooked"? I spoke to some people who admitted they saw the story and they were confused. Hopefully all truth seekers who came across this story were confused (at least at first) when reading it. I know I was. How can you not be confused? Since when do "spies" come out and admit something like this to the world?? The "spies" all "admitted" that they were told to report the ISIS threat in such a way that it would "portrayed the terror groups as weaker than the analysts believe they are"
There is no reason to believe this entire report is not yet another psyop on the American people if not on the very military brass and spies themselves. When everyone is being lied to and fooled then the confusion only stacks up even higher, doesn't it? I believe more than ever before, the U.S. military themselves especially the high ranking brass are being absolutely lied to in order to preserve the grand agenda of the new world order. From a tactical point of view it would make sense to lie to the very generals and colonels that are leading the way and use them also as patsies. We're all being lied to and this entire report about spies admitting that they were told to lie about ISIS is just more propaganda to make people think that ISIS is an unbeatable super-human force. They are not! And this is just another underhanded counter-intelligence-style propaganda to justify more and more war against a perceive monster sized enemy. The only strength ISIS has is whatever the U.S. and Israel and its allies have given it via their training, arming, funding, promoting and glorifying. Everything else is just a psyop to keep the show going. And this psyop now is extending to where the mainstream media is pointedly telling you the U.S. trained ISIS commanders, while at the same time making you think ISIS is a real enemy of the U.S.. It doesn't matter how the mainstream media and its appointed special writers try to color up the story with human interest and romance, the story remains the same. The U.S. has trained and created those fighters who are now posing as ISIS and we should not be moved or fooled by any future events attributed to ISIS. Just close your eyes and when you hear "ISIS" tell yourself "CIA and Mossad". This is the story of the ISIS show which we have endure for over a year now. This is important because ISIS will very likely be the weapon they will use against Americans to deal the final blow to it. ISIS has been built up as the mother-ship boogey-monster of terror groups primed to unleash its venom on America. It's the greatest terrorist force for the new world order and that is why they have so much publicity, endless weapons, supplies, and indestructibility. They are the chosen masked assassins for the globalist to usher in their new world order and they are not going away. Never give up your guns. Exercise your 2nd amendment rights and arm yourself against a tyrannical government that sponsors terrorism against its own people to expand its own power over those people in the name of keeping them safe. Start educating yourself about the need and the roll of having a Constitutional Militia. We the people must wake up soon and take back the power of the sword. There is a method for working toward this goal but it starts with education. I highly recommend everyone watch this video series by Dr Edwin Vieira on the Constitutional Militia and how it is necessary for the security of a free state. Until the power of the sword is properly restored back to the people through state empowered Constitutional militia of the several states, the threat of false flag terrorism is almost impossible to stop. It is important to continue exposing the ISIS psyop show and elevating awareness and consciousness about this evil agenda so that the awareness may potentially play a role in discouraging future attacks before they happen or exposing future attacks in the early phase to change the course of the aftermath. We never know how much impact the power of knowledge and awareness of this issue will have on humanity. So let's keep exposing these stories and events and hope it will bring out the best in humanity.